Enjoy birding In the Western Ghats in the state of Kerala in India. Spot many Thattekad endemics at Salim Ali Bird Sanctuary, visit Munnar hill station, Periyar Tiger Reserve & Kumarakom Bird Sanctuary on this holiday. Spend a night on a traditional rice houseboat & relax at Mararikulam beach. English speaking guide, all tour transfers & local naturalist birding guides included. You will be met at Cochin Airport and transferred to your hotel in this Arabian seaport, now known as Kochi, that was at the centre of the spice trade for many centuries. Check in and relax in the beautiful southern state of Kerala - fondly called "God's own Country". This morning your driver will collect you from your hotel in Cochin and introduce you to the beauty of rural Kerala, as you travel 1.5-hours to Thattekad. Thattekad is the home of the small Salim Ali Bird Sanctuary, situated in a biodiversity hotspot in the Western Ghats mountains. Is a great place to see over 500 different bird species - including frogmouth, cuckoos, owls and other rare endemic birds. Today is devoted to bird watching with a local naturalist in Salim Ali Bird Sanctuary. Covering an area of approximately 25 km² of evergreen lowland forest, lying between the branches of the Periyar River, this bird sanctuary has a variety of eco-systems - including riverine, grassland, evergreen, scrub, dry deciduous and lowland forest - making it one of the richest birding habitats in India and home to most of the endemics of the Western Ghats. Here you will find both forest and water birds including the Indian pitta, which spends almost six months here over the winter. Other birds you can find here include the Orange-headed thrush, Large-billed leaf-warbler, Jerdon's nightjar, Indian cuckoo, Oriental darter, Whiskered tern, Ceylon frogmouth, Pompadour green pigeon, Yellow-browed bulbul, White-bellied treepie, Rufous babbler, Crimson-backed sunbird, White-bellied blue flycatcher, Wayanad laughing thrush, Malabar parakeet, Malabar grey hornbill, Mottled wood owl, Oriental bay owl, Oriental scops owl, Collared scops owl, Brown fish owl and Spot-bellied eagle owl. You should also be able to sight the Red spurfowl, Grey jungle fowl, Black-throated munia and Grey-headed fishing eagle. This morning enjoy a visit to the Salim Ali Bird Sanctuary with a naturalist. Afterwards we continue travelling for 3-hours up steep winding roads to the scenic hill station at Munnar with its vast tea plantations. After checking into your hotel, relax in the clear mountain air of this summer resort in beautiful Kerala. We search the 'sholas' (high altitude tropical montane forests) and grasslands for the Nilgiri pipit, Painted bush quail, Nilgiri wood pigeon, Black flycatcher, Orange flycatcher, Nilgiri flycatcher, White-bellied shortwing, Broad-tailed grassbird, Grasshopper warbler and other species. Afterwards you can visit the Tea Museum and taste some of the best food in India. Note: The Tea Museum is closed on Mondays. Enjoy some more early morning birding around your lodge with a naturalist guide today. Afterwards we drive 4-hours down from the hills of Munnar and continue through coffee and pepper plantations to Periyar National Park in the Western Ghats mountains. Situated in the Cardamom and Pandalam Hills, this park forms the watershed for two important rivers - the Periyar and Pamba. It is home to several rare and endangered species including tigers, although they are rarely seen. Along the way you may see the Indian robin, Sirkeer malkoha, Short-toed snake eagle, Bluefaced malkoha, Black eagle, Large grey babbler, Common babbler, Jungle bush quail, Grey francolin and the rare Yellow throated bulbul. In the afternoon enjoy a boat trip on Lake Periyar, a haven for bird life including herons, hornbills and egrets and where you may see wild elephants coming down to the lake for a drink. This morning enjoy birding accompanied by a local naturalist, as you observe the birds, butterflies and other wildlife that live in these evergreen and moist deciduous forests, interspersed with grasslands and riverside scrub. There are over 320 bird species (including over half of India's endemics) and 35 different mammals in Periyar National Park, a 400 sq. mile (640 sq. km) wildlife sanctuary that it is an important elephant and tiger reserve and home to many threatened species. This park is also home to gaur, sambar, wild boar, giant squirrel, flying squirrel, jungle cat, sloth bear, nilgiri tahr, lion-tailed macaque, nilgiri langur, nilgiri marten, stripe-necked mongoose and fruit bats. We will spend the day searching for some very special species, including the elusive Wynaad laughingthrush. Other birds to look out for include the White-rumped needletail, Brown-backed needletail, Oriental honey buzzard, Black eagle, Black baza, Pompadour green pigeon, Mountain imperial pigeon, the migratory Chestnut-winged cuckoo, Yellow-browed bulbul, Grey-breasted prinia, Thick-billed warbler, Brown-cheeked fulvetta and Asian fairy bluebird. We may also spot the Woolly-necked stork, Besra, Vernal hanging parrot, Jungle owlet, White-rumped spinetail, Black-naped monarch and Little spiderhunter. In the afternoon there is the opportunity to interact with Asian elephants while they bathe and shower in the river. In the evening enjoy a Kalaripayattu martial arts show. Enjoy some more early morning birding with a local naturalist in the area around your lodge. Afterwards we drive 4-hours to the small town of Kumarakom on Vembanad Lake, the largest backwater in India. Check into your lodge and in the afternoon enjoy some more birding accompanied by a local naturalist near Kumarakom Bird Sanctuary, which offers a safe refuge for many migratory birds. This morning board your air-conditioned Rice Houseboat set on Vembanad Lake. 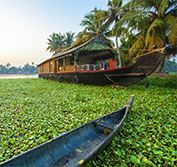 This network of backwaters, lakes and rivers stretches over 930 miles (1,500 km) and provides a vital waterway for transporting people and their produce, once used to transport goods from isolated interior villages to the larger towns but now largely used for pleasure. As the water is level with the land here, spend the afternoon relaxing and watching the agricultural lives of the people who live along the canals and work in the rice paddy fields, as you cruise through the Kerala Backwaters. In the evening see the sun setting over the tranquil backwaters and enjoy dining on delicious local Kerala cuisine prepared by your chef. After breakfast disembark at the merchant town of Alleppey and drive 30-minutes to the beach village of Mararikulam. Along the way we stop at a Local Village to gain an insight into how the people live and work in this region. We then continue to our beach hotel to relax on the shores of the sparkling Indian Ocean. At leisure to relax at Marari Beach in the fishing village of Mararikulam. Enjoy holistic Ayurvedic treatments, for which this region is famous. You can participate in yoga classes, visit the Velorvattom Mahadeva temple and shop for local handcrafts in the market. You can also enjoy the tasty but spicy southern Indian cuisine, particularly their wonderful seafood, but because of strong currents swimming in the sea here is not recommended, as there are no life guards on duty. There is also a butterfly garden, which can be explored with a in-house naturalist, along with the coastal birds of the region. Transfer 1.5-hours to Kochi Airport for your flight home.